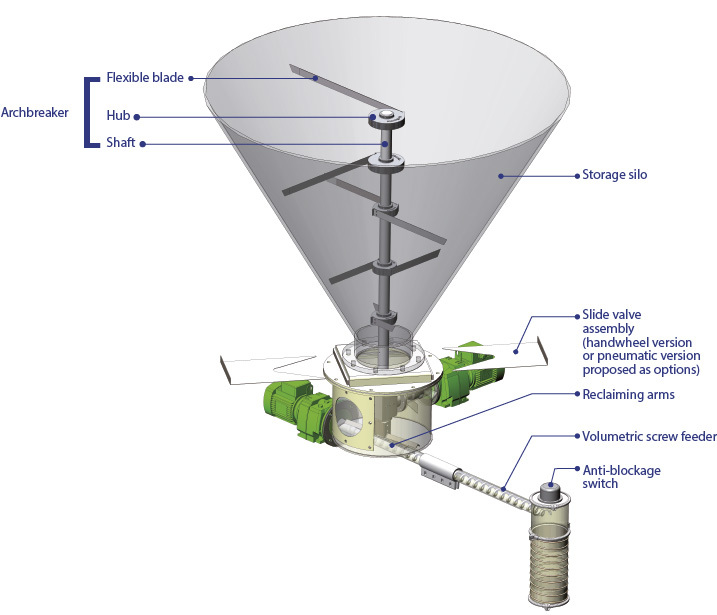 Sodimate’s patented DDS 400 Mechanical Bin Activator is an innovative and mechanical system that allows the total discharge and an accurate feed of powdered materials stored in silos. The unit can be easily fit onto any silo cone, and is entirely adaptable to a client’s specific needs. Multiple screw feeders: Thanks to our leading expertise and technical know-how, our Bin Activator can accomodate multiple feeders, each feeder functioning independently, capable of sustaining a high flow on one side, and a low flow on the other. Mechanical extraction of virtually any material, without contamination or variations due to unique ADVANCED DENSITY CONTROL. are also driven by the gearmotor, rotate to completely fill the metering conveyor with product. This ensures an accurate volumetric dosage. Sodimate’s unique silo discharge system uses gentle agitation, rather than vibration or fluidization, when discharging and feeding the dry powder. Vibrators mounted directly on bins or silos can cause issues such as compacting, bridging, and arching. Our silo mechanical bin activator avoids such issues and prevents rat holing and erratic silo discharge often seen with air injection systems & vibration.